Hierarchical complexty is the fundamental construct that underlies the Lectical™Assessment System (LAS). It is reflected in two aspects of performance, the hierarchical order of abstraction of concepts or skills and the logical organization of arguments. Hierarchical Complexity Theory predicts that some increases in hierarchical complexity will take the form of increasing hierarchical order of abstraction. This is because new concepts are formed at each complexity order as the operations of the previous complexity order are "summarized" into single constructs (Fischer, 1980). Burtis (1982) and Halford (1999) suggest that this summarizing or "chunking" makes more complex thought possible by reducing the number of elements that must be simultaneously coordinated, freeing up processing space and making it possible to produce an argument or conceptualization at a higher complexity order. For example, the concept of honor, as understood in the abstract mappings level, "summarizes" an argument coordinating concepts of reputation, trustworthiness, and kindness constructed at the single abstractions level. Similarly, the concept of personal integrity, as understood in the abstract systems level, summarizes an argument coordinating concepts of honor, personal responsibility, and personal values constructed at the abstract mappings level. The figure below illustrates hierarchical integration. First order, 2nd order, and 3rd order concepts are associated with definitional, linear, and multivariate logical structures, respectively. A definitional logical structure identifies the concept and describes it in terms of a single aspect. For example, at the single representations level (1st order representations), definitional logic allows representations to stand in for persons, objects, simple states, or simple actions—as in, "I not touch that." At the representational mappings level (2nd order representations), a linear logical structure (referred to as a mapping by Fischer and his colleagues) describes the relationship between representations—as in, "If you're good, your mommy might buy you ice cream," in which being good is coordinated with a particular concrete benefit. 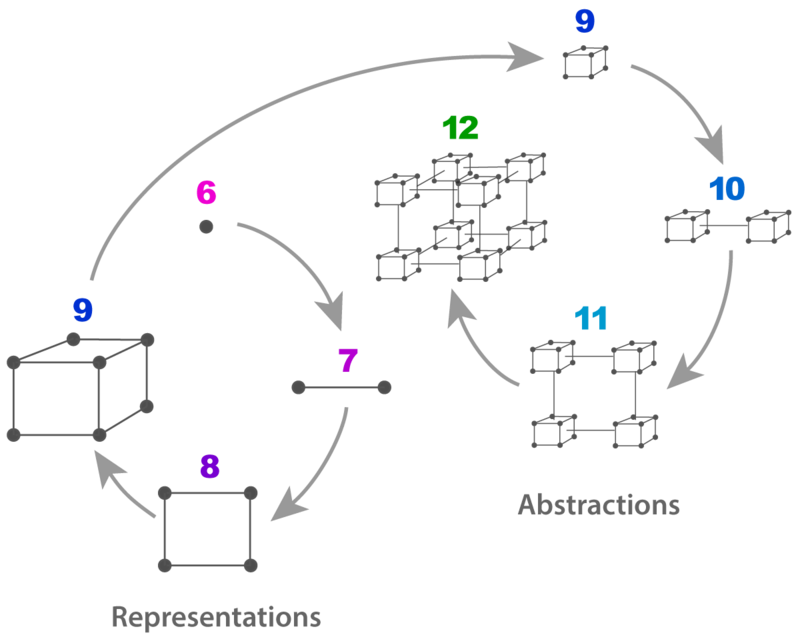 At the representational systems level (3rd order representations), the logical structure is multivariate. Multiple outcomes of behavior can be considered—as in, "If I am good, I won't get punished, and I might get to do something fun." To learn more about skill level definitions, click here. Dawson posited a three-layer model of conceptual structure. 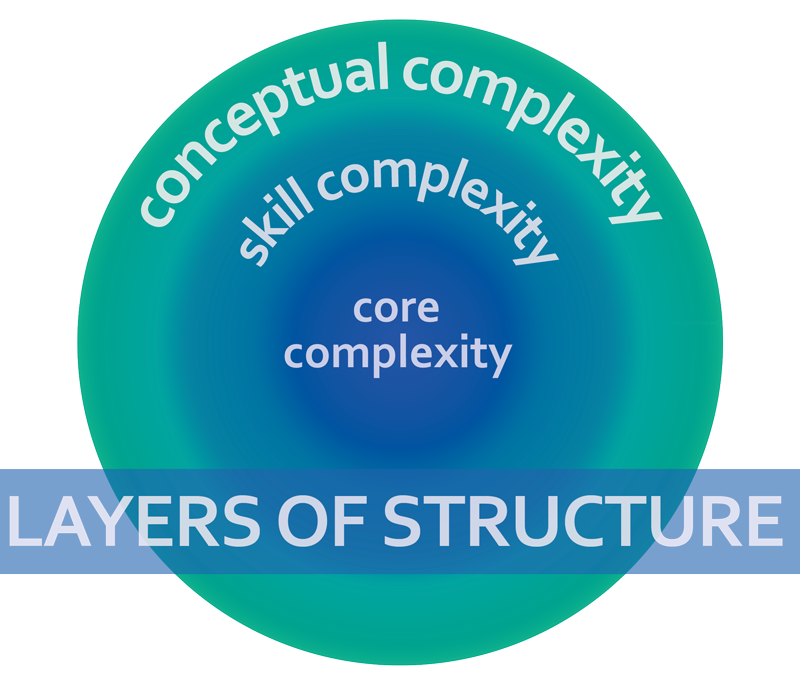 In this model, the surface layer represents conceptual content or conceptual complexity, the middle layer represents domain-level structure or skill complexity, and the central layer represents "core" structure. The Lectical™ Assessment System (LAS) targets core structures. These are hierarchical order of abstraction and logical structure. Most domain-based scoring systems target domain-level structures such as sociomoral perspective. Many of these scoring systems also target conceptual content. LAS analysts assign a score based on hierarchical order of abstraction and logical structure. To do this, they must be able to observe how these manifest in a given performance. This means that scoring is an iterative process—one in which the rater moves back and forth from one layer of structure to the next, finally converging on an interpretation of the core structure of a performance. "Well, this isn't a very sophisticated notion of the role of education in the good life. Especially because, at first, I thought that he was saying that you'd be richer, money-wise (laughter), with an education. That would make 'richer' a representational notion, but I see that it's actually at least abstract, because it's related to this idea of open-mindedness. It seems there are two variables [richer life, open mind] that are in a logical relation to one another—as in, "If you get a good education, your mind will be more open, and therefore you will have a richer life." This is at least an abstract mapping, but could it be higher than that? Well, richer life could be higher than abstract, and so could open mind, so I'm looking for evidence that they are—but the perspective here is of the individual person and his life, without bringing in anyone else's perspective, or a social perspective, so you can't say, really. Abstract mappings; I'll stick with abstract mappings." In this example, the rater appeals to all three levels of structure. The content level is referenced in her initial attempt to understand the argument, and again when she double checks her understanding at the end. The domain structure level is briefly included when she examines the social perspective of the respondent to see if there are grounds for considering the possibility that the statement is higher than abstract mappings. The core structure is reflected in her analysis of the hierarchical order of abstraction and logical structure of the argument (abstract variables, logical relation). It is easy to see from this example how central meaning is to the scoring process. Without a correct interpretation of the meaning of a statement, the rater cannot even begin the process of scoring. For example, knowing which sense of richer is intended by the respondent is essential to a correct interpretation of the hierarchical order of abstraction of the concept. To learn about how the LAS is used in assessment development, click here. Learning to score with the LAS is a long and challenging process that involves many hours of instruction and study. At this time, we only teach qualified individuals who are working with Lectica. Our Certified Analysts are the only people who can legally call themselves Lectical Analysts or claim to be using the LAS to score performances. We also offer a self-guided course, Foundations of Lectical Assessment (FOLA), that covers the core literature and basics of the scoring system. The FOLA does not qualify participants to score, but does provide the basic knowledge required to conduct research with LectaTests and DiscoTests.